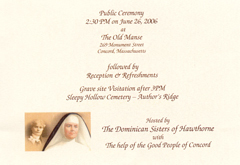 On June 26, 2006 at 2:30 pm, the Dominican Sisters of Hawthorne will host a public ceremony and reception at the Old Manse, 269 Monument Street, Concord, MA. 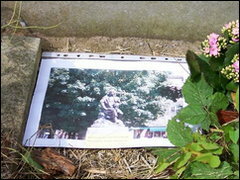 Grave site Visitation on Authors' Ridge in Sleepy Hollow Cemetery will be possible after 3:00 pm. 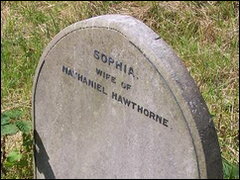 The remains of Sophia and Una Hawthorne will be moved from the grave sites at Kensal Green Cemetery in London to a place alongside Nathaniel Hawthorne.Sophia was buried in Kensal Green upon her death in 1871 at age 62. 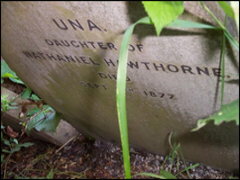 Una was also buried there in 1877 at age 33. 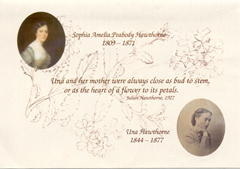 Hawthorne's other two children, Julian and Rose returned to live in the United States. The Dominican Sisters have borne the financial responsibility for the care of the Kensal Green graves and have recently suggested that the graves be moved to Concord, MA. The Dominican Sisters of Hawthorne is a Catholic order established by Rose Hawthorne in Hawthorne, NY, to care for cancer patients. 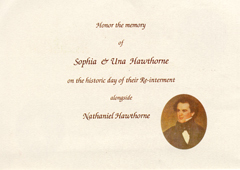 On Tuesday, February 4, 2003, Rose Hawthorne was proposed as a candidate for sainthood. A recent article in the Boston Globe discusses plans for the re-interment.